Another Penguin update is coming this summer and it might actually have a positive impact on your internet marketing. Earlier this week Google’s Matt Cutts released a video detailing what Google has been working on and what changes will be coming this summer. “Penguin 2.0” has the dual aim of penalizing black hat SEO and better recognizing the sites best suited to the search at hand. In his video, Matt Cutts was somewhat vague and there were no clear indicators as to the best SEO tactics but, as always, having a great site that users love with fresh interesting content was mentioned. One of the primary aims of the algorithm change is to better identify advertorials and eliminate their impact on page rank. It’s not necessary to eliminate all paid links or advertorials, but they should be clearly identifiable with conspicuous disclaimers. Ones that are not could have a negative impact on page rank. If the value in your paid links or advertorials lies solely in SEO, you should rethink them. Along with advertorials, Google will be targeting link spammers. Updates to the algorithm will make for more sophisticated link analysis. The better the info is about links, the easier it will be for Google to assign value to them. 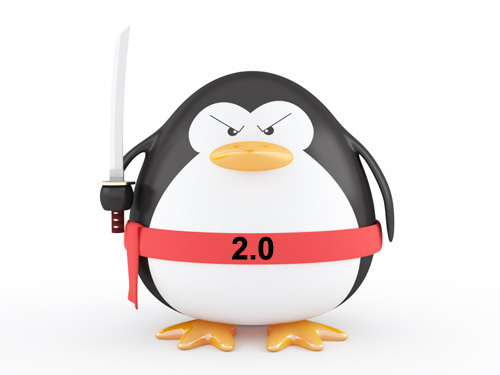 The Penguin 2.0 update addresses other issues that have been a concern for webmasters. Detection of website hacking will be improved and they hope to be able to not only more readily identify when a site has been hacked but also provide details. Knowing whether the site was hacked or hit by malware can make fixing it a lot easier. In hopes of making search results better and promoting sites with good information, Google will be looking for sites that are authorities on a specific topic, such as medicine or travel. These sites will then receive a higher ranking. Here your best bet, as always, is good content that is updated regularly. They will also be looking closer at sites that are in the gray area between information and advertising. They are investigating signals that could be used to make a better determination of the site’s value. Lastly, Penguin 2.0 will impact the way SERPs are presented. Currently, you may see repeat clusters of results from one site, usually not on the first page but later in the results. With the update, repetition of these clusters will be less likely. Once a cluster appears in the results, Google will try not to present it again in subsequent pages. As with earlier updates, there is certain to be a commotion from those whose sites have been negatively impacted. And as with the previous updates, sites that do not engage in black hat SEO and have quality information will not be harmed. In fact, these newer changes might even benefit those of us who continue to play by Google’s rules.